Rejecting Newmarket, the board chose to enter into a multi-year tuition agreement with Barrington, essentially continuing the status quo. As it has in the past, the board chose to redraw the bus line to shift students to Mast Way, but to exempt current Moharimet students and their siblings. 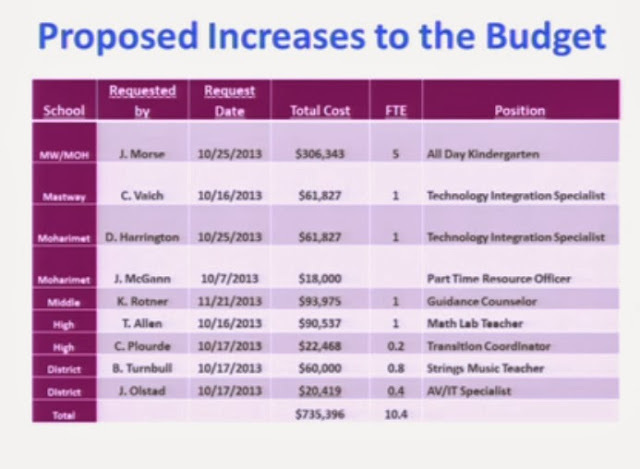 A strings teacher and a math tutor were added to the budget while total spending increased less than 1%. Tonight, the ORCSD school board approved and signed an agreement commencing in 2015-2016 to accept a maximum of 200 high school tuition students from Barrington. The Barrington school board approved the identical agreement last week. The 10 year agreement would need to be approved by voters of both districts in March, 2014 before taking effect (recent post). Barrington, which has no high school of its own, wants to keep its "choice" model. Barrington students get to choose which high school to attend. Currently the choice is between Dover, Coe Brown and Oyster River. The taxpayers of Barrington pay the Dover tuition, which is the lowest of the three. Parents who choose to kick in a couple thousand dollars extra to make up the difference in tuition can send a child to Coe Brown or Oyster River. ORHS currently has around 70 tuition students from Barrington, under the terms of a Memorandum of Understanding that is renewed annually. The current tuition of $13,000 does not include special education. 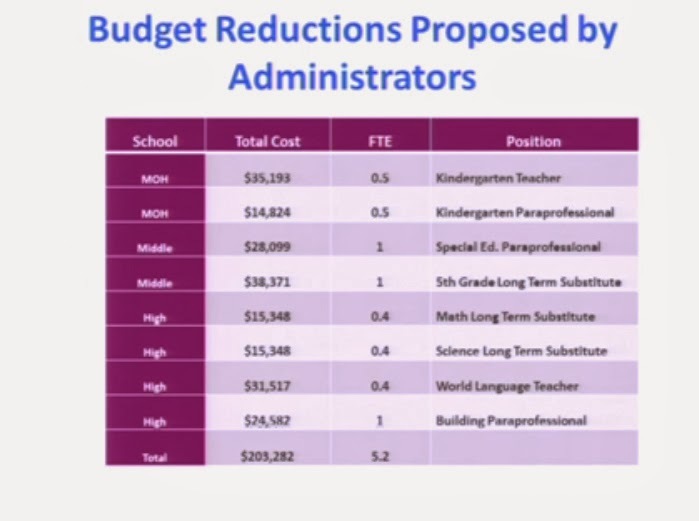 The current MOU has Barrington fully responsible for the special education cost incurred by its own students. I haven't read the actual agreement yet, so this is just relaying how it was described at the board meeting. The newly signed agreement has a tuition of $14,000 that includes the expected special education load. Superintendent Morse stated the agreement has Barrington paying for additional staffing to serve its own special education students beyond the expected load. $14,000 for 2015-2016 seems like a bargain to me. When you count special education Barrington is probably already paying more than that now. Barrington has agreed to setting a minimum number of students each year and to pay Oyster River 95% of any tuition shortfall in the event of underenrollment. This allows Oyster River to hire based on projected enrollment without having to bear the risk of Barrington students choosing not to come to ORHS. The agreement states that when at least 125 Barrington tuition students enroll, ORHS becomes Barrington's "school of record." The school of record is required to accept any students that might move to Barrington during the year. I'm not sure what else the ominous sounding term implies, but it does seem like something Barrington wanted out of the deal. This is essentially the status quo option (continuing with Barrington) with a couple of twists. Barrington is agreeing send between 50 and 130 more students, to ramp up on a specific schedule, and to guarantee the minimum number in advance. This gives Oyster River the predictability for planning it desires. Barrington locks in the ORHS option, gets a great tuition rate that includes special education and gets ORHS as its school of record. 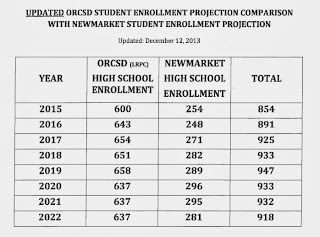 The Newmarket option was rejected by the board because the new enrollment projections, when combined with Newmarket's enrollment projections, cause the total enrollment to exceed ORHS's functional capacity of 915 many years in a row. If you adjust for the 60-80 half-day vocational/technical students from Newmarket, you keep under 915. It seems some have taken this high school functional capacity number of 915 as a magic indicator of overcrowding. The number comes from a capacity study -- it's 85% of the maximum capacity, which counts each classroom as 22 seats (board policy) or the number of workstations in it if it's fewer. The capacity study assumes that around 160 empty seats is full capacity. If board policy was 23 seats max, functional capacity would be closer to 950. Nonetheless the board made the right choice opting for Barrington over Newmarket. The transition is going to be so smooth as to be unnoticeable. That's in marked contrast to the Newmarket option, which would have been a large shock all at once. Until I see the actual agreement I'll reserve judgement on how I'll vote in March. The elementary reconfiguration issue (recent post) was resolved tonight. The board chose to redraw the bus line, shifting Moharimet neighborhoods to Mast Way. The board approved a rather generous Family Exemption -- what I had previously called Full Grandfathering. With it, any students at Moharimet can finish at Moharimet. Their siblings can as well, as long as they are in the same school. Though a bit unclear as stated in the motion, the intent was to keep kids from ever having to transfer and to keep families from having kids in both schools at the same time, but nothing more generous. With the Family Exception, we only shift around 10 kids a year, so it takes five years or so before enrollments equal out. The Redraw option was moribund a month ago, when the main choice seemed between K2/34 and managed enrollment. I'm going to take a bit of credit here and say my letter helped revive what has been the district's traditional remedy. The board mentioned, but did not take up the Mast Way Choice suggestion of my letter. The idea there was that if a family opted to transfer their child from Moharimet to Mast Way, the district would provide transportation. Thus every family at the overcrowded Moharimet would have chosen to be there. The superintendent stated that currently anyone wishing to transfer may, but without action from the board transportation could not be provided. Instead, to reduce Moharimet's overcapacity faster, the board expanded the map of areas to be shifted. They began with the map that's been around for a while, drawn by the superintendent in consultation with the transportation director. In the most surprising vote of the night, the board unanimously chose to shift the rest of the Wedgewood neighborhood to Mast Way. Member Lane brought up Wedgewood and lamented that it was a victim of previous redistricting. Then the board proceeded almost gratuitously to victimize it again. No one had any idea how much the addition would affect overcapacity. I found the entire exercise ill advised -- if it works as intended we'll end up shifting too many kids to Mast Way. Last week the board approved a budget that raises spending 0.9%. This does not include the effect of the new teacher's contract currently being negotiated. Nonetheless, the board achieved its stated goal of a spending increase no larger than the inflation rate. The board chose to approve the Math Lab Teacher, which was changed to a Math Lab Tutor at a much lower cost. The board actually went beyond the proposed 0.8 Strings Music Teacher. Instead the board approved a 1.0 Full Time Music Teacher to concentrate on strings. The new position coincides with an effort to reorganize the music department. Instead of the current building-based system, the plan is to switch to a "strands" system, where each music teacher potentially plies their trade in multiple buildings. Everyone seemed very enthusiastic about the new plan. At the end of the December 11th meeting, the board voted to authorize the superintendent to reach out to David Taylor to avoid litigation. The next regular board meeting is on a Thursday, January 2. Anybody out there want to run for school board?